The FM11RF08 contactless smart card is based on FUDAN FM11RF08 IC, which is connected to a coil with a few turns, and then embedded in plastic. The communication layer (Mifare RF Interface) complies with part 2 and 3 of the ISO/IEC1443A standard. The security layer sport the field proven CRYPTO1 stream cipher for secure date exchange of the Mifare classic family. It is contactless transmission of data and energy and no battery is needed. 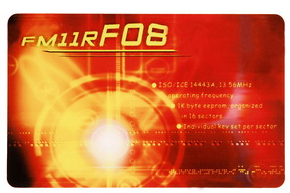 FM11R08 is compliant with Mifare 1k, therefore it is sometimes named China Mifare 1k when selling in Asia, Africa and Latin America. Organized in security separated 16 sectors supporting multi-application use. Use flexible defines assess conditions for each memory block. Each sector has its own secret files for systems using key hierarchies.